Mokume Gane was developed from the art of Japanese metal smiths. Nan Roche, an American artist, has been one of the first to use this technique with modelling clay. 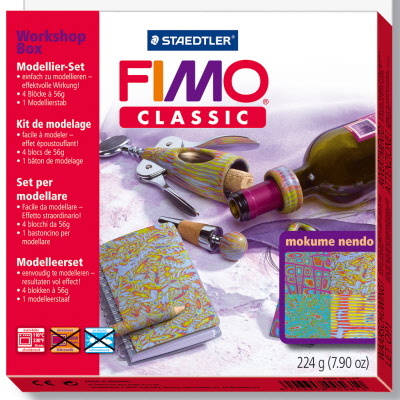 Includes 4 x 56g FIMO Classic, modelling tool, instructions. Contents: 4 x 56g FIMO Classic (white, golden yellow, magenta and light turquoise), modelling tool, and step-by-step illustrated instructions. Also required: acrylic roller eg Polyroller or Pasta Machine and sharp blade eg Polyblade.